Meet Mafdel at Hannover Messe exhibition – Hall 25 Stand A34. From 1st to 5th of April 2019, Mafdel is at Hannover Messe exhibition to show your our new range of thermoweldable belts and conveyor belts. Construction of a 3600m² production facility. 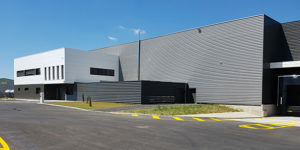 A new 3600m² production facility was built to increase increasing production demands and optimize the development of new products. MAFDEL joins the movement La French Fab. 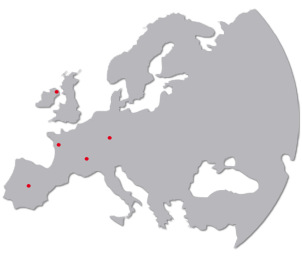 Being proud to manufacture its belts and conveyor belts in France, MAFDEL is now part of the La French Fab movement that internationally promotes industrial know-how and products made in France. Our range of conveyor belts was presented at the International Foodtec India exhibition in Mumbai from 27th to 29th September 2018. New documentation on retaining clips. The retaining clips lock the sprockets, wheels and discs to prevent lateral movement on a 40x40mm square shaft. See our documentation and contact us for more information. Presentation of DEL/DRIVE and POSITIVEBELT positive drive belts at the NIBA convention. DEL/DRIVE and POSITIVEBELT Positive Drive Tapes were presented at the United States Conveyor Belt Manufacturers and Distributors (NIBA) Annual Convention from September 12 to 15, 2018. From 23rd to 27th of April, Mafdel is at Hannover Messe to show you our range of thermoweldable belts and conveyor belts. Meet Mafdel at Hannover Messe exhibition, from 24th to 28th of April and discover our range of thermoweldable belts and conveyor belts. Until 22nd of march, meet Mafdel at Pro2Pac exhibition with our partner GB Belting, and discover our range of extruded belts, monomaterial belts and positively driven conveyor belts. 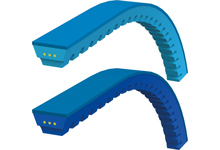 The new positively driven DEL/DRIVE 50-25 conveyor belt has a pitch of 50mm on one side, and 25mm on the other. >> Please refer to the DEL/DRIVE 50-25 leaflet for further details. 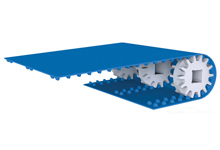 The positively driven DEL/DRIVE 25 conveyor belt is now available in a wider 1200mm width. Compliant with the strictest hygiene standards, it is capable of negotiating small pulley diameters, creating small transfer distances and compact drives. >> Please refer to the DEL/DRIVE 25 (1200mm width) leaflet for further details. We are pleased to introduce the new range of welding tools for use with Mafdel extruded round and V belts (MC50 and MC150) and also conveyor belts up to 200mm wide (MC100 and MC200). >> Consult the documentation for MC50 welding iron for thermoweldable extruded belts. >> Consult the documentation for MC100 – MC200 welding irons for thermoweldable conveyor belts. >> Consult the documentation for MC150 welding iron for overlap joining of extruded belts. New thermoweldable, bi-material v-belt, reinforced with aramid cords. The Polybelt+ belt complies with the most stringent food standards and offers optimum specifications for roller tangential drive and load transfer. Highly resistant to abrasion and cuts, the Polybelt+ belt offers great roller flexibility and a very high load capacity. Available in a cogged format in polyurethane 85 or 95 ShA. It is also very easy to weld using Mafdel overlap welding tools. The POSITIVEBELT positive drive belt is reinforced with aramid cords and offers optimum characteristics for driving rollers. It offers a high load capacity and good grip while eliminating the risk of slippage. The POSITIVEBELT conveyor belt made from polyester elastomer offers excellent resistance to elongation. It can be used on wide spacing and support medium to heavy loads. In some cases, its low friction coefficient allows for product accumulation. The POSITIVEBELT belt made from polyester elastomer also offers excellent resistance to temperature variation.